We’ve broken down Amazon’s entire line of streaming devices to help you pick out which one is best for your needs and budget. Designed to stay out of sight, the budget-friendly Amazon Fire TV will allow you to enjoy 4K HDR content from all major streaming services, like Netflix and Prime Video. Powered by Amazon Alexa, the streaming player allows you to search for content and control your smart home gadget via a dedicated voice button in its remote. It supports Dolby Atmos and has a gorgeous, easy-to-use interface. Don't let its small size fool you — this affordable streaming stick from Amazon is just as fast and offers the same number of channels as more expensive models. It's small enough to slide into a pocket for using at hotels when traveling, and it plugs into the your TV's HDMI input. Note that this option only supports 1080p HD playback, but it's a perfect tech treat that won't break the bank. The Fire TV Cube is a powerful and feature-filled streaming device that's perfect for couch potatoes who lose remotes frequently, because it has several built-in microphones and a speaker that can pick up your voice in the other room. Now you can interact with Alexa to order pizza, change channels, and switch inputs on your HDTV. If you want to cut the cord on cable, consider purchasing this Fire TV bundle to save some dough and get free access to cable channels. It comes with a nifty HDTV antenna to allow you to capture local channels such as ABC, CBS, NBC, and Fox (among others) in high definition for free. The antenna is capable of getting a signal from up to 35 miles away. This 4K smart TV from Toshiba was developed in collaboration with Amazon. It runs a full-fledged version of FireOS, so you have access to over 15,000 channels and apps without the extra expense of a streaming box. Its remote control has Amazon's voice assistant, Alexa, built right in. The TV also supports HDR content, which offers extremely realistic picture quality. If you’re thinking about buying a new streaming device to make your TV a bit smarter, you’ve probably heard of the Fire TV. If not, a Fire TV is an affordable and easy way to stream your favorite TV shows, movies, music, games, and sports from apps like Netflix, Hulu, and HBO Now. It plugs into one of the HDMI ports on your TV, connects to the internet, and has a much more intuitive interface than you’re probably used to. Amazon offers four different Fire TVs that vary significantly in pricing and features. We want to help you decide which one is best for your living room, so you can spend more time actually streaming shows and movies than deciding what device you’re going to watch them on. Check out our guide to the key differences between each version, and get ready to enjoy a whole new streaming experience. Trust us, you’re in for a treat! BOTTOM LINE: THE AMAZON FIRE TV IS THE MOST AFFORDABLE WAY TO ENJOY 4K HDR CONTENT FROM STREAMING APPS LIKE NETFLIX. The Amazon Fire TV is a great pick for buyers looking for a small and speedy streaming device to watch 4K and HDR content. It hangs off the back of your TV, keeps out of sight, and promises the best video quality that services like Netflix and Amazon Instant Video have to offer. Compared to the more affordable Fire TV Stick, the Amazon Fire TV features a 40% faster quad-core processor, making it a great option for gamers who want to pair it with a controller. It also has 8 GB of storage for storing apps and downloads. It offers an intuitive and well-polished interface, with plenty of apps to install and stream from. The included remote is comfortable to hold and easy to use. You can find something to stream with your voice and a simple press of a button. For instance, you can queue up your show by just saying “Alexa, play Stranger Things.” Our only complaints are that the remote doesn’t offer any volume controls and you need to purchase an adapter separately for a wired internet connection. The Fire TV does pair to your Echo smart speaker, though, so you can control playback and start shows using your voice without the remote. Consider bundling the Fire TV with an Echo Dot speaker if you don’t already have one already! BOTTOM LINE: CORD-CUTTERS ON A BUDGET WILL APPRECIATE THE FIRE TV STICK’S AFFORDABLE PRICE AND ITS PORTABLE DESIGN. JUST KNOW THAT IT DOESN’T SUPPORT 4K CONTENT. Amazon’s entry-level streaming device is about the size of a small pack of gum, and it has a built-in HDMI jack for easy installation anywhere. We think the Fire TV Stick would make for an excellent gift or travel companion for those who don’t want to be held back by a hotel TV’s limited channels. Like the original Fire TV, this device boasts access to tens of thousands of channels and apps for instant streaming. It comes with the same voice-controlled remote as other models, and requires a separate adapter for hard-wired Internet access (don’t worry — it still has Wi-Fi!). Unfortunately, the Fire TV Stick limits resolution to 1080p, so if you want to watch in 4K, you should purchase the Fire TV or Fire TV Cube instead. There’s no Dolby Atmos support, either. Still, it’s an excellent value and still a great performer. 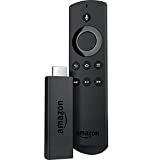 Amazon also bundles the Fire TV Stick with its small Echo Dot speaker, which it can pair with for voice controls and searching without relying on the remote. BOTTOM LINE: BUYERS INTERESTED IN VOICE-CONTROL, HARD-WIRED INTERNET CONNECTIONS, 4K STREAMING, AND GAMING SHOULD OPT FOR THE TOP-TIER FIRE TV CUBE. If you’re looking for the best, most top-of-the-line, featured-filled streaming device, the Fire TV Cube is for you. The Fire TV Cube marries the voice functionality of an Echo speaker with the video-streaming capabilities of a Fire TV streaming device. Plus, it streams both 4K and HDR video, and it supports Dolby Atmos surround sound. It’s the only Fire TV that lets you turn your TV off and on, change channels, and switch inputs using your voice. It also comes with the same remote as the other Fire TVs for those moments when manual and quieter navigation is necessary. Besides that, the Cube is equipped with a Ethernet jack for faster, more reliable wired connections. What makes it stand out, though, is its built-in microphones and speaker that allow for far-field voice control. You can shout “Alexa, order popcorn!” in the kitchen, and the Fire TV in the living room will order popcorn from your Amazon account to be delivered straight to your doorstep for your next movie night. You can also use the microphone to control playback of your TV, to control your home entertainment gear, and interact with other smart home products that work with Alexa. It’s a powerful and sleek-looking option that’ll change the way you interact with your television. BOTTOM LINE: IF YOU WANT TO CUT THE CORD ON CABLE, CONSIDER PURCHASING THIS FIRE TV BUNDLE TO SAVE SOME DOUGH AND GET FREE ACCESS TO BASIC CHANNELS. 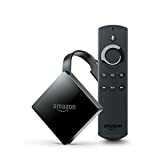 This is the exact same Fire TV we first mentioned above, with the only difference being that this model comes with a nifty HDTV antenna to allow you to capture local channels such as ABC, CBS, NBC, and Fox (among others) in high definition for free. We think this bundle is the perfect solution for those who don’t want to pay for cable or satellite TV. The antenna is paper thin and is meant to be mounted indoors on a wall or window. In addition to its thin design, the multi-directional antenna comes with a 10-foot coaxial cable that easily plugs into your HDTV. It’s completely reversible, with black or white sides to match your home’s decor, or you can even paint over it for a more personal touch. The antenna is capable of getting a signal from up to 35 miles away, it’s backed by a 1-year warranty, and you can check to see how strong the signal will be in your area here. BOTTOM LINE: IF YOU’D RATHER OPT FOR AN ALL-IN-ONE SOLUTION, THIS 4K HDTV FROM TOSHIBA HAS A FIRE TV BUILT RIGHT IN! The Toshiba Fire TV Edition comes with an Amazon Fire TV built right in! It delivers a phenomenal picture despite its low price. It even supports HDR, which produces a bright, lifelike image that’s full of color. The TV includes access to the Alexa voice assistant, and although it isn’t hands-free like the Fire TV Cube, you can pair the TV with your existing Echo speaker. 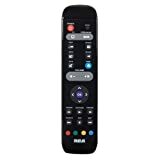 Its included remote lets you search for shows or movies with your voice, and it adds a volume rocker, mute, and live TV button below its playback controls. There are even hot keys for Amazon Prime Video, HBO, Netflix, and PlayStation Vue — buttons that aren’t available on any other Fire TV remote. We think that this TV from Toshiba is an excellent value, considering its superb picture, slew of smart features, numerous ports, voice controls, and ease of use. Which Amazon Fire TV Should I Buy? The Amazon Fire TV is the most versatile option for streamers searching for a solution to watch 4K content. It supports Dolby Atmos surround sound, 4K, and HDR video, and it’s packed with a powerful processor for playing games and streaming live video. It’s still an affordable and portable option with voice controls and an intuitive user interface to boot. If you’re a cord cutter and want to ditch cable once and for all, consider bundling it with a HDTV antenna to stream channels over the air. The Amazon Fire TV Stick is great for those on a limited budget who want a small and reliable streaming device that you can take anywhere. It may not offer the same 4K quality as the Fire TV or Fire TV Cube, but picture quality is still impressive in high definition. If you have a 1080p HDTV and are content with its picture, the Fire TV Stick is a good device that’s worth considering for some extra savings. The Amazon Fire TV Cube is the ultimate streaming device. It comes packed with a microphone array for voice controls, a powerful processor, and a built-in speaker. If you already have a 4K television and have the budget for it, you should definitely spring for the Amazon Fire TV Cube over any other model. Lastly, for those users who prefer an all-in-one solution, the Toshiba Fire TV Edition offers the excellent, vibrant Fire TV operating system — without the added bulk of a streaming box or dongle. You’ll love that the remote has volume controls — buttons that aren’t found on any other Fire TV. However, if you splurge for the Fire TV Edition, you’ll have to swallow a price that’s 40 times more expensive than the Fire TV Stick, but you get gorgeous 55-inch 4K picture in the tradeoff!